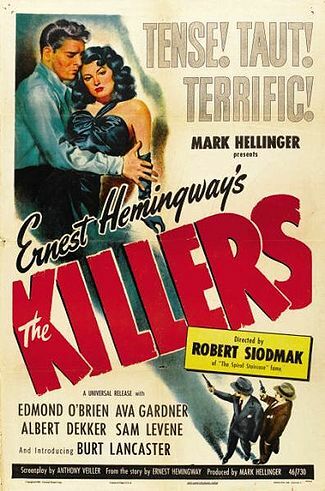 It’s been said that Robert Siodmak’s The Killers was Ernest Hemingway’s favorite adaptation of one of his works which was, in this case, a short story. As a film-noir, it works on numerous levels from the cinematography, to the score, to the young stars, to the ingenious narrative. 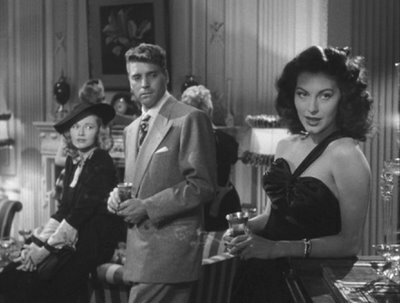 Some credit, of course, can go to Hemingway for the concept, but a lot of the creative success must be given to the likes of Siodmak, John Huston and a host of others. The film opens in an instant with two lurking gunmen entering a diner in a small New Jersey town called Brentwood. Their target is a washed up boxer called “The Swede” and we do not know why, but after terrorizing a few locals, they riddle him with bullet holes and that’s the end of it. It’s an intense sequence because the thugs (William Conrad and Charles McGraw) are antagonistic and Miklos Rozsa’s score is nearly relentlessness. The story could have ended there if it wasn’t for an insurance investigator named Reardon (Edmond O’Brien), who takes an interest in the dead man so he can find his beneficiary. In the present, he begins to piece together little fragments of the boxer’s past slowly but surely. It starts out with Nick Adams who witnessed the thugs and worked with The Swede when a mysterious man came by the filing station. Soon after Ole Andreson stopped coming in to work and a while later he was dead. That’s all Nick knows, and it does not give Reardon much to go on. Next, he tracks down The Swede’s beneficiary who turns out to be a kindly hotel maid. The connection seems slim, but it turns out that she kept him from committing suicide after a tough evening where he tore his flat apart. It’s still not much to go on, but Reardon thanks her and moves on with his investigation, still intrigued. Then he goes to Philadelphia and gets his biggest puzzle piece from a policeman named Lubinsky, who used to run with the Swede as kids and probably knew him the best of anyone. He and his wife explain to Reardon how Pete Llund, as he was known, lost his final bout and was forced to move on with his life. About that time he met Kitty Collins for the first time and was infatuated for good. Charleston is next the old stooge who spent a good many years locked up in a cell with the Swede. Reardon comes upon him at the funeral and from the old convict, he learns about a bank job that the washed up boxer got involved in. The other partners were Blinky, Dum Dum, and Big Jim. They are Reardon’s next points of interest. Blinky is near death and recounts the robbery. Dum Dum crosses path with Reardon and shares about the aftermath of the job which went sour. Next, comes Big Jim whose tight-lipped about the past. Last but not least is Kitty, who is fearful that Reardon knows something and can actually blackmail her. That’s when everything begins to line up and heat up. After being absent for so long, the Killers are back in the picture and Rozsa’s score picks up again threatening the status quo of the film. They put us on edge again and for good reason. But the real focal point of the ending is Kitty. Obviously, Citizen Kane has so many layers of interest, but it shares a similar narrative arc to The Killers where the main character is killed and his story gets pieced together thanks to flashbacks that are furnished from the present. Except, in many ways, the story of The Swede intrigues me more as a character. Charles Foster Kane is a magnate with an impressive if not tragic life. Swede’s life is probably just as tragic except it was more humble and chock full of more crime. He was small time and he even failed in love when his friend Lubinsky got the girl of his dreams. It’s an interesting life too that ended unnaturally with gunshots rather than Kane who died as an old man. The Swede was cut short in a tragic sort of way and I think that’s part of what intrigues Reardon. It’s more than a job, but a mysterious story of a man’s life that the audience also gets taken along for. As far as storytelling goes, it’s great and it really works to flesh out these characters. Ultimately, Reardon feels like the main character of sorts, but such an aura is built around The Swede and Kitty that it is understandable that this film made stars out of Lancaster and Gardner. They are certainly memorable partially because we hardly ever seen them in the present (except for Kitty at the end). Their whole persona is built off of what others say and there’s something interesting about that. There’s the fatalistic and sullen Swede which turned out be a perfect debut for Burt Lancaster. Ava Gardner has the soft seductive whisper of lethal poison all wrapped up in a beautiful body and it leaves a major impression. Above all else, The Killers is a prime example of film noir blending German Expressionism from Siodmak’s native Germany with more documentary style sequences that take inspiration from post-war neo-realism. The opening sequence especially drips with noir sensibilities that, at its most dramatic, looms with shadows from the exterior of the diner to the low-key lighting of the Swede’s bedroom. For a while, it’s even difficult to know that’s Burt Lancaster reclined on the bed because his whole body is fully encased as he speaks. It’s only when he gets up into the light that we finally are introduced before he gets gunned down a few minutes later. It’s great staging and the atmosphere remains for a great deal of the film from the prison cell to Big Jim’s mansion. Each place is contrasted with the present or other locales like Reardon’s office which are more natural in lighting. It doesn’t get much better than that. Starring Burt Lancaster in his debut as well as Ava Garner, the film begins with two gunmen killing “The Swede” (Lancaster) in a small town. Interested in the mystery, an insurance investigator named Reardon (Edmund O’Brien) tries to piece together the past of the dead man. He works to gather more information and talks to “The Swede’s” former friend as well as a hotel worker, and a past cell mate. Through a series of flashbacks Reardon slowly strings together the past including “The Swede’s” boxing career, his time in prison, and especially an alluring woman, Kitty Collins (Gardner).In the climatic scene Reardon finally meets the beautiful Kitty. Only after a series of events and her quick getaway does he grasp the whole truth. Kitty was a deadly double crosser. However, in a cruel twist her partner in crime is killed and her fate is sealed. This is an exciting film noir with solid acting and a great style of storytelling. This was my first experience with director Robert Siomak, and I must say I was quite impressed. 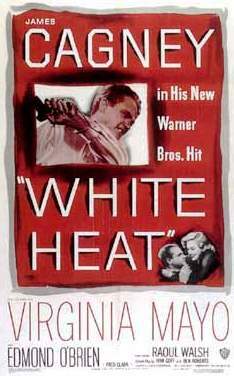 Starring James Cagney, Edmund O’Brien, and Virginia Mayo, once again Cagney does the gangster role. However, his Cody Jarret is older and more psychotic than ever as he leads his band of thugs. Although he has a beautiful wife, the main woman in Jarret’s life is his mom who watches over him. After an initial robbery, Jarret beats the rap by confessing to a smaller crime. While he is in jail the police plant one of their men (O’Brien). Eventually the pair and a crew of cronies break out and plan their next move. However, the undercover man cleverly tips off his colleagues and they follow in hot pursuit. Pretty soon the only one left is Jarret and he is isolated near high above near a gas storage tank. In a crazy fit, Jarret yells to his ma that he has made it to the top of the world as he goes up in flames. This movie has wonderful suspense in the end and Cagney is chilling yet again.